Sometimes a particular album unexpectedly becomes an energizing companion in a new life adventure, and this is one of them for me because of the forward-looking way it stimulates my imagination, just like good sci-fi that speaks about real life. The kaleidoscopic aural assault of the Germans is an apotheosis of fresh and captivating blackened avant-garde metal. The listener becomes tightly engaged in a dramatic journey through the haphazard evolution of a little planet in the Solar System, projected at break-necking speed by foolish policies towards an uncertain future dominated by technology at the expense of the human dimension. The analysis, lucid and realistic (as it is the case when professional scientists are actively involved in underground music), inevitably reveals a socio-political awareness behind the regretful melancholy and sense of bewilderment: this is the kind of noblety of soul we need more of right now. Galvanized by a flawless stream of electronic and progressive sounds, the work has a very clean and clinical edge but, in my ears, it is more akin to an incessant eruption of incandescent magma courtesy of the powerful, sparkling guitars, the flight of the cleverly eerie keyboards, the booming fullness of the bass, and the relentless, often formidable, drumming. Many will approach this album from a black metal viewpoint: this will provide an exciting surprise for those who don't turn a blind eye on the severe necrosis affecting the genre, both in sound and spirit. On the other hand, for those who hold a more holistic perspective on extreme music, black metal will not constitute the main focus for the appreciation of “The Initial Frontier Part 1”. In my personal music pantheon, this is the best avant-garde metal album I have heard in years, and I suspect that it will remain so for a while, given that the new one by Code is a big disappointment and DHG’s has been delayed until 2014. I am happy to place Vyre’s orffering on the same shelf as the new masterpiece by Ihsahn, just to counterbalance the classy output by the Norwegian master of progressive extreme metal with a thoroughly underground album that is, as well as intelligently crafted and well played, also gratifying and playable to death. “The Initial Frontier Part 1” thrives on a dynamic amalgamation of contrasts. The emphatic use of metal riffage juxtaposed to the futuristic sounds of keyboards and synths, helps creating a highly cinematic atmosphere, while the soaring black metal outbursts (Coil of Pipes: oh, the goosebumps!) complement and enhance the use of captivating melody, a trait that distinguishes a lot of past and current German progressive music (the exquisite Dinner Auf Uranus/Nocte Obducta and the much missed Kamera Obskur immediately come to mind, but also Todtgelichter and, above all, the unforgettable genius of Lunar Aurora). The vocal performance of KG Cypher, which adds to the apocalyptic palette by sounding ruthlessly monochromatic and desperately human at once, offers yet another dimension to an already rich aural landscape, accentuating the engaging atmospheric shifts. The eclectic avantgarde feeling, which incidentally never once feels over-the-top (indeed one of the great merits of this work), is animated by well chosen samples from Albert Einstein’s speeches shedding light on the duplicitous use of science, the daresay obligatory jazzy outburst (normally something I do not particularly enjoy, but the immediacy of the approach is actually a winner here), a sprinkle of robotic vox and an emotionally evocative piano. The first instalment of this must-have concept album, released on Supreme Chaos Records, has been recorded with exceptionally vivid dynamics and a perfect blend of classic vs. synthetic /cold vs. rich tones, thus capturing in full the alienating duality of modern man, torn between past and future, self-hate and empathy, pig-headed ignorance and noble yearnings... The album is a winner because each one of its five hefty offerings is an audio-visual spectacle on its own (impossible to keep the imagination still), but it does step up a notch when the already mentioned Coil of Pipes kicks off gloriously, then flowing into the touching dismay of Digital Dreams, and ending in melancholy epicness with Miasma. Exciting stuff from start to finish: it beats me how these guys managed to keep it so fresh and free from the hyper baroquisme that plagues much of the avantgarde! 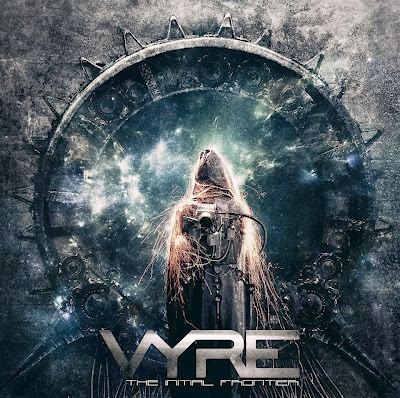 Oh, I would have loved it if Vyre had delivered a double whammy upon us, but I guess I will have to be patient to find out more of the tragic story of this lonely planet "lit by a thousand moons but never enlightened by a sun" (Fragile Equilibrium).